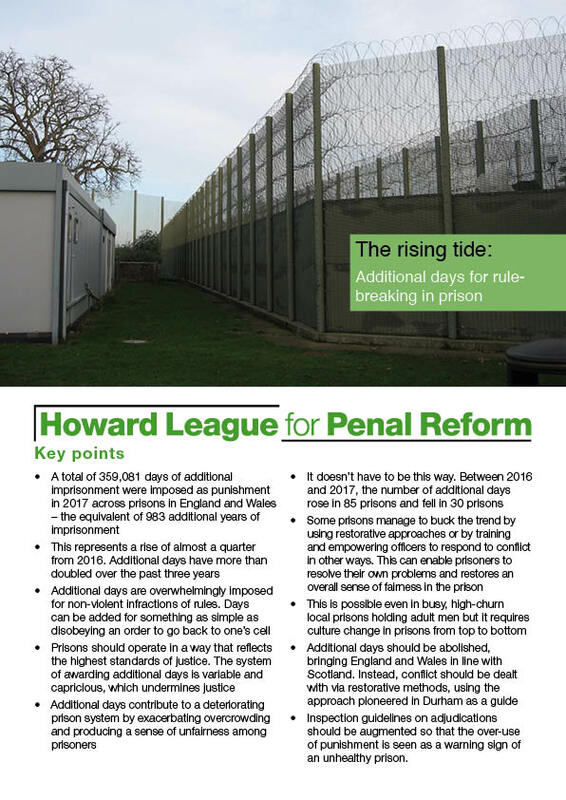 The rising tide: Additional days for rule-breaking in prison reveals how the disciplinary system in prisons has become unsustainable, with the total number of additional days of imprisonment handed down nationwide more than doubling in three years. The use of additional days has increased as prisons have been brought to breaking point by overcrowding and staff shortages – soaring from fewer than 160,000 in 2014 to almost 360,000 last year. This has coincided with rising levels of self-injury behind bars. The report breaks down the figures for each prison in England and Wales, revealing the hotspots where adjudicators are resorting to draconian measures most often. It also highlights good practice at prisons that have managed to buck the trend – either by using restorative approaches or by training and empowering staff to respond to conflict in other ways.